Since the other challenge I put forth has been rejected, I now offer you all the Darkness Challenge. This uses dark colors and low saturation to provide an air of mustinold and strangelity. Only use pixel art, so no using brushes to blend colors. You must complete the entire terrain.png. Nothing else is required. On that date, a poll will be held. Your submission to the poll will require the terrein, and exactly three screenshots showing off the pack. Godspeed to all you toiling workers. Now, that... That is a good challenge palette. Surreal packs incoming, assuming people join. I shall consider this challenge, and, presumably, not finish it, regardless. EDIT: Woah, there's grays in the middle! Thank you. It reminds me of purgation after death. Thank you. I am sure the deadline will be extended as it usually is with challenges. Interesting pallette, I would participate, but I am getting really busy with stuff like updating a pack, revamping a pack, making a new pack, and just plain practicing. It's going to be tricky though, how are you supposed to do all the wool colours? Add extra colours and hope no one notices. 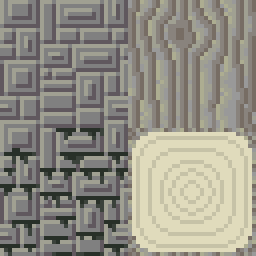 I made cobblestone, it's my first attempt at pixel art 32x. I'll post a picture, but imgur's crashed. No, I am not one to cheat. I have my own methods of wool-making with limited palettes. I was hardly being serious. I know, I was just saying, I have my own wool-making tactics when I am out of colours. Iron, can we choose one more extra colour? Like in the MS Paint challenge? I got dirt and side grass now. I've decided I'm going to go for a mechanical-apocalyptic style texture pack. It's looking rubbish at the moment. Also, I suggest you read the rules. You may add 2 (two) colors to the challenge, but you must use them in at least 8 (eight) blocks each. (Not necessarily together.) They also must be under Saturation 17. EDIT: for wool, try and shade using different combinations of colors, to give the illusion of different colors. You may add 1 (one) color to the challenge, but you must use it in at least 8 (eight) blocks. Shouldn't you have a saturation/lightness limit? I made time, and I am doing this! Simple pack ftw! Haha, simple packs. Do you always do that? Mostly, it is hard to get a good looking simple pack though. Not when you do them. EDIT: No more post restrictions! I will celebrate with a bottle of pixelated wine. Here is what I've done so far. It's a 32x pack. The 1x thing is prety legit. It makes my game look like crap.